When I checked into my room on a sunday evening, room was not clean at all. But when I went back down to reception I was given a bigger room for the error. The staff was very friendly and helpful. We requested a quiet room which it was even with a large, late event one evening. It was clean, easy to find, and we liked the in room kitchenette! Breakfast was good as well. Comfortable beds in a quiet room, and a nice breakfast to start the day. Perfect as a stopover during a business trip. The staff was very helpful by pointing us to a restaurant nearby. Great for one night stay. Even had fridge and coffee maker and some basic cooking equipment. Very clean room and bathroom, great breakfast, easy parking, quiet location. Friendly staff, well equipped room which was clean and modern. The loft bedrooms are fun. Outstanding staff. 24/7 front desk. Food available late evening at the bar area. And delivery options also. Comfy bed and large bathroom and kitchen area. The kitchenette was an added bonus to the room and the kettle, to be self sufficient. 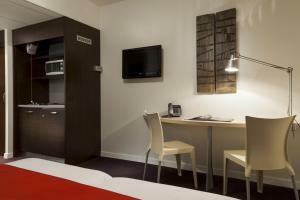 Lock in a great price for Quality Suites Nantes Beaujoire – rated 8.1 by recent guests! 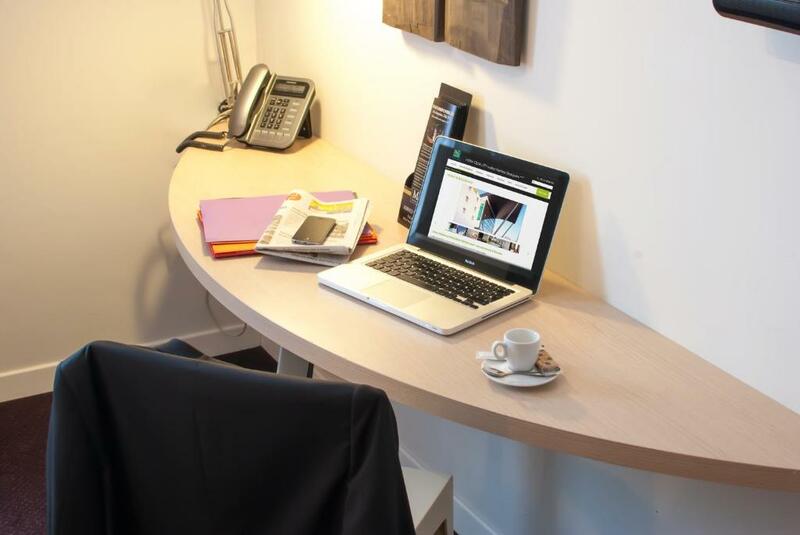 Located a 10-minute drive from Nantes city center, Quality Hotel & Suites Nantes Beaujoire features modern air-conditioned accommodations with free internet access and free access to the fitness room. 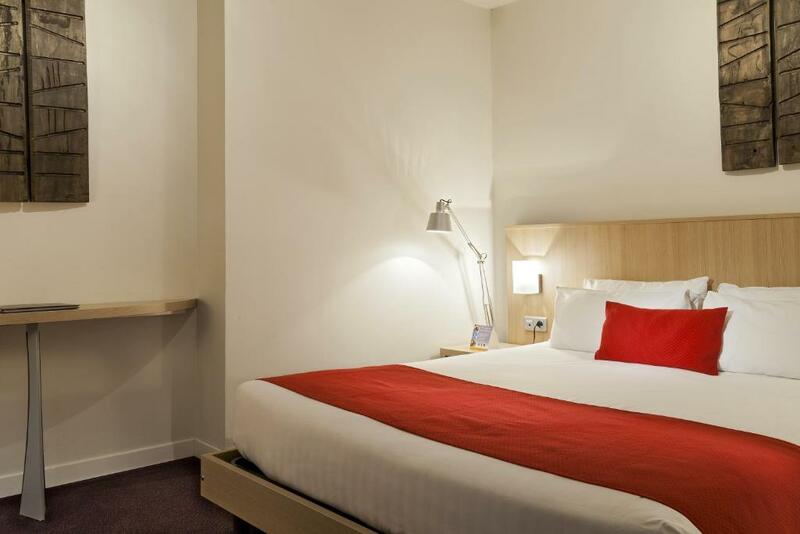 The stylish guest rooms at Quality Hotel & Suites Nantes Beaujoire are soundproofed and equipped with a flat-screen TV with cable channels. All rooms feature a fridge and tea and coffee making facilities. Studios include a kitchenette with a microwave and a dining area. Breakfast is also offered every morning with the daily newspapers. 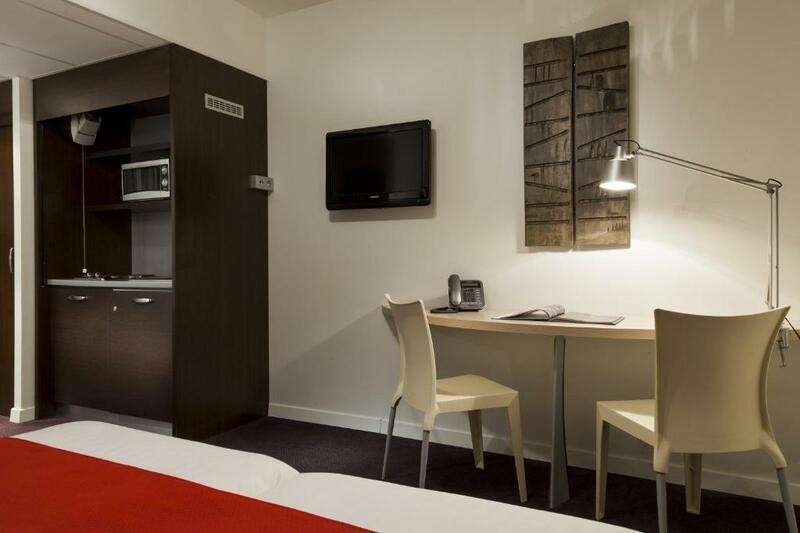 With free private parking on site, this Quality Hotel is a 20-minute drive from Nantes Atlantique Airport. The Ducs de Bretagne Castle is 3.1 mi away. Free WiFi access is available throughout the property. This property is also rated for the best value in Nantes! Guests are getting more for their money when compared to other properties in this city. When would you like to stay at Quality Suites Nantes Beaujoire? This air-conditioned room features free internet access and air conditioning. Offers a kitchenette stocked with kitchenware, a microwave and refrigerator. This spacious room features a sitting area and a kitchenette with a microwave. Free internet access is included. A flat-screen TV, free internet access and cooking facilities are provided. This quadruple room features a electric kettle, air conditioning and soundproofing. Notre établissement va vous surprendre par sa modernité, ses dimensions et par l'originalité du lieu. Notre équipe souriante et dynamique vous attend pour un séjour dont vous vous rappellerez! Bienvenue à Nantes! L'objectif de l'équipe : Faire de votre séjour une réussite. Pour cela, nous sommes là, tout le temps, pour vous accompagner et répondre à vos attentes. Notre établissement hors normes rime avec proximité et disponibilité. Venez en profitez pour votre prochain séjour nantais. Situé aux portes de Nantes, le quartier de la Beaujoire est vivant et dynamique. La présence du parc des expositions, du stade de la Beaujoire et de la zone de Nant'Est Entreprises fait de cette zone une des plus active de Nantes. Que vous soyez professionnels ou particuliers, à la recherche d'un hébergement d'une nuit ou pour un long séjour, venez découvrir nos solutions, il y en a forcément une pour vous. House Rules Quality Suites Nantes Beaujoire takes special requests – add in the next step! Quality Suites Nantes Beaujoire accepts these cards and reserves the right to temporarily hold an amount prior to arrival. Please note that payment in cash is not possible after 19:00. No light over kitchen area. The breakfast had plenty of choices and with very good quality, the staff was very friendly and helpful. Everything was great. The evening receptionist/bar person was faultless. A credit to the Hotel. We could not change the heating in the room so we felt a bit cold. We were there for business so it was perfect for 2 nights stay. Plenty of secure parking. Around 1 hour walk to the city centre so you need transport. Room facilities were great. Small kitchenette, everything was tidy and clean. Good value for money. Located at the outskirts of Nantes. A car is the must. Nice service, friendly staff. Same comment as above - when I checked into my room on a sunday evening, room was not clean at all, not acceptable in such a huge hotel complex. Kitchen area had very little light to operate, stove controls not visible and microwave was dual purpose (grill and micro) but I could not get it to work normally. A light above the kitchenette area would have been nice. A map with door numbers as it was a bit complicated to find the numbers as the were not in order all the way around the floor. In each corridor the numbers changed. 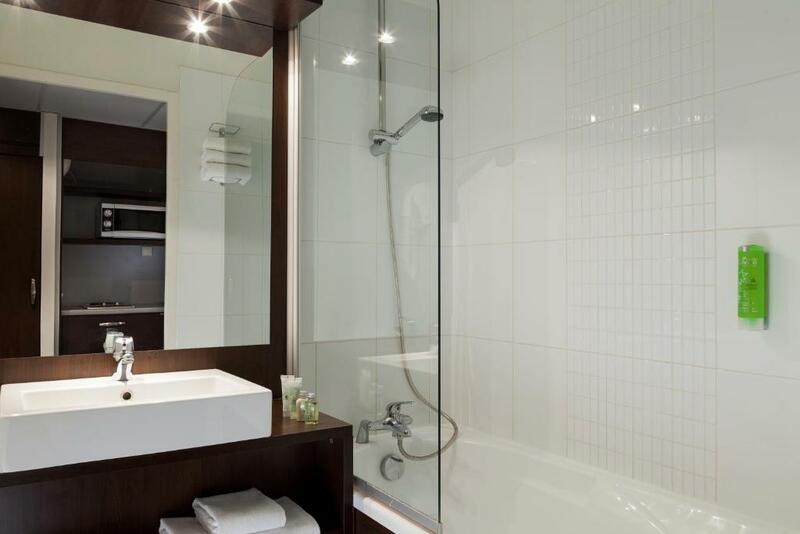 We liked exceptionally Clean and Comfortable facilities. The bed was comfortable and sheets crispy clean. A fix hairdryer in the bathroom. You can regulate the temperature to your desire. There is a kettle which is great for the people who like to drink other than coffee. Kitchenette has all the necessaries and there is also some cutlery a fridge, 2 electric hobs for cooking and microwave. Down stairs was a bar that was open. The Staff spoke English and our stay here was very pleasant. We are definitely going back again. Needs a light in the kitchen area. Heating we were unable to increase. All very convenient, and the bed was lovely. We love having a small kitchen and fridge. Will be using them again. This property is a very long walk to public transportation. While 15-20 minutes sounds doable, after sightseeing and carrying purchases, it can feel like forever. We later discovered that this hotel is primarily booked for events and business conferences, etc.